The woman who could be the next President of Haiti  and the first female to be elected to that office  doesn't strike you as an insurgent when she walks into a room. But Mirlande Manigat, a smartly dressed, soft-spoken, 70-year-old Sorbonne Ph.D., insists she's after nothing less than a "rupture" with Haiti's dysfunctional political establishment. "Not one that's violent or brutal, but there must be change," Manigat said in an interview with TIME at her campaign's Port-au-Prince headquarters. "We can't leave so many millions of Haitians abandoned anymore." So far, her message is resonating inside the western hemisphere's poorest country, which was ravaged in January by an earthquake that killed some 230,000 people  and is beset now by a cholera outbreak that has claimed almost 1,000. Two weeks before Haiti's Nov. 28 presidential election, voter polls show Manigat the clear front runner in a field of 19 candidates. In the most recent survey by Haiti's independent Economic Forum, released late last week, Manigat significantly widened her lead over President René Préval's hand-picked candidate, engineer Jude Celestin, to eight points, 30% to 22%. That the government's choice is trailing isn't a surprise: Préval's often AWOL response to the apocalyptic quake has alienated most Haitians from his INITE (Unity) Party. Their frustration with Haiti's corrupt, incompetent political elite, which many feel INITE represents, is a big reason the country was exhilarated by the outsider candidacy of Haitian-American hip-hop star and philanthropist Wyclef Jean. When Haiti's electoral council disqualified Jean's bid in August on residency grounds, the question was where his support, especially among the large cohort of young voters, would shift. To the surprise of many pundits, much of it seems to have moved from the gold chains of rapper Jean to the pearl strands of matriarch Manigat. (She's also eclipsing Michel "Sweet Micky" Martelly, himself a Haitian pop-music star, who ranks third in the Forum poll with just 11%.) If so, one reason may well be that "many Haitians feel the time has come for a woman to lead the country," says prominent Haitian historian and political analyst Georges Michel. "So here's Manigat, a well-respected scholar. She takes many of the populist positions that [Jean] had, and they respond to her grandmotherly image. To a lot of them, it seems to inspire confidence and trust." Those qualities will be in loud demand, because Haiti's next President will oversee some $10 billion in reconstruction aid pledged by international donors. Even though she's a woman, Manigat is by no means a political outsider. She is, in fact, a former First Lady, the wife of former President Leslie Manigat. They met in the 1960s at the University of Paris, where he taught history while in exile  having been condemned to death at home by brutal Haitian dictator François "Papa Doc" Duvalier, who died in 1971  and she was his student. They married in 1970, living in France, Trinidad and Venezuela before returning to Haiti in 1986 after the ouster of Duvalier's son and successor, dictator Jean-Claude "Baby Doc" Duvalier. In 1988, Leslie Manigat, under the banner of the Assembly of Progressive National Democrats (RDNP), won the presidency in an election marred by military meddling. After only four months in office, he was overthrown in a coup. He ran again in 2006 and finished a distant second to Préval. But although Préval did not win the 50% necessary to avoid a second round, the electoral council never held a runoff  and in protest, Mirlande Manigat withdrew as the RDNP's Senate candidate. "I cannot support illegality," she said of her controversial move. In that regard, Manigat and her supporters may see Nov. 28 as a chance for revenge, especially since many Haitians believe her 80-year-old husband will be a power behind her throne if she wins. But Manigat insists that she and the RDNP  which she calls a center-left, "capitalist with a human face" party in the tradition of successful moderate Latin American leftists like Brazilian President Luiz Inácio Lula da Silva  want to check a venal elite that she accuses of "grave social indifference and insensitivity. It was there before, but after the earthquake it has shown itself in worse ways." Manigat, vice rector of the Université Quisqueya in Port-au-Prince, tells TIME that along with tackling Haiti's nightmarish inequality via reforms like universal access to public education  only about half of the country's children even attend school  one of her big aims is to make the Haitian state something more than an effete subordinate of foreign NGOs. "There are many NGOs positioning themselves to receive the [$10 billion], yet they want to operate outside of state control," says Manigat. "My government will not operate the NGO way." Manigat feels Haiti's earthquake recovery "has not really started"  admittedly, rubble removal and the rehousing of some 1.5 million displaced Haitians have been frustratingly slow  but like most of the candidates, she's not specific about how she'd hasten it. She backs changing Haiti's constitution to allow dual citizenship, which could aid the country's reconstruction by tapping into the resources and talents of the vast Haitian diaspora, including more than a million Haitian Americans. But critics, based on some of her teachings of Haitian constitutional law, fear that Manigat could have authoritarian designs to expand presidential powers  which she denies. Manigat has been helped by the uncharismatic campaigning of Celestin, 48, a relatively unknown technocrat. On the stump in the southern port city of Jacmel recently, he repeated his less-than-electric slogan of "stability and continuity" while touching on criticisms of the Préval government by saying, "We know that there were things that were a little ignored." That has pushed erstwhile Préval supporters like Port-au-Prince carpenter Jourdanie Damler, 35, to Manigat's camp. "The INITE guys have forgotten about us," says Damler. "I'll try Madame Manigat." Since no candidate is likely to win 50% of the vote in the first round, the race will probably come down to a Jan. 16 runoff (less than a month before the Feb. 7 inauguration). Some wonder how Haiti can even conduct a credible election given the lingering quake chaos and cholera epidemic. 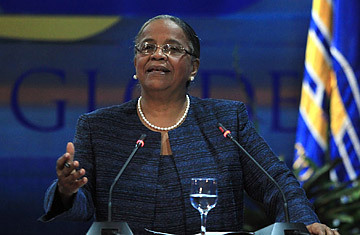 Manigat says the vote "has to happen" for Haiti to move forward, but after the 2006 dispute, she adds, she and the RDNP "will be vigilant against fraud trickery." This grandmother won't tolerate it. See TIME's full coverage of the Haiti earthquake. Read about how building a hospital can be illegal in Haiti.